According to the expert estimates, presently, Kazakhstan has at least five advantages over the other young independent states. The first is well-weighed and consistent economic reforms, proper combination of liberalization, development of private sector and state regulation; commitment to the global priority – from economic reforms to democracy enhancement. Commitment to the defined course and predictability of all global programs make the country attractive for foreign capital. The second is sophisticated tax, financial and budget systems that inherited the best world practices and closely interconnected between each other. The third is successful and timely pension and housing and utilities system reform. Implementation of the state program of housing construction ensured stable growth of the housing construction rates. Investments to the housing construction increased almost 10 times over the last decade. The fourth is internal policy which is consistent with reality and aimed at preservation and strengthening of the political stability, international and interreligious accord, democratic reforms. The fifth is consistent and balanced foreign policy, establishment of strategic partnership and friendly relations with foreign countries and leading international organizations. All these advantages should be applied for achieving progress in the priority areas – in acceleration of the process of economic and political modernization of the country based on the combination of economic, social and democratic transformations. 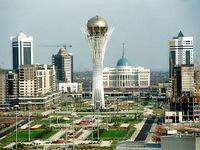 Kazakhstan is presently recognized as one of the most dynamically developing countries of the world. The average annual economic growth made about 10% over the last five years. The per capita gross domestic product reached the level of four thousand U.S. dollars. In 2012, the GDP in real terms was almost twofold or 95% higher than the level of 1991. The per capita GDP made 12500 U.S. dollars in 2012. Sustainable economic growth allowed to expand the social dimension of the state policy. According to the World Bank, Kazakhstan has entered the group of countries with upper middle income. The minimum pension payments increased twofold over the last five years. Presently, the country leads in the CIS in terms of the pension provision. The salaries of the public sector employees increased threefold. The unemployment rate has decreased to the level of the European Union and presently makes about 7.5%. Kazakhstan is one of the most attractive countries for investors in the region and the CIS leader in terms of the attracted foreign direct investment per capita. USD 108 billion of foreign direct investments from more than 60 countries of the world were attracted to the country over the recent years. Domestic investments have increased as well. The World Bank ranked Kazakhstan among top 20 countries of the world in terms of investment attractiveness. The evolutionary way of development of our country allowed to preserve and strengthen political stability and create a Kazakhstani model of society based on interethnic and interreligious accord which Kazakhstan is rightly proud of. The Assembly of People of Kazakhstan founded on the basis of a system of national and cultural centers became an object of thorough investigation and a source of positive experience for many countries. The most important task set by N. Nazarbayev for the nearest future is further political modernization providing a balance between all branches of power – legislative, executive and judiciary. Over the years of independence Kazakhstan has pursued responsible, well-weighed and balanced policy aimed at provision of international and regional stability and security, establishment of mutually beneficial partner relations with the other countries. Kazakhstan still considers strengthening and development of cooperation with Russia, China, USA, European Union, Asian and Middle East countries as one of the priorities of its foreign policy. One of the current priorities in the foreign policy is active participation in the fight against international terrorism, extremism, drug trafficking, transnational crime and AIDS. Participation in the activities of the UN, CICA, SCO, CSTO, peacekeeping campaigns and practical efforts on settling conflicts and wars is of special importance for the country. In 2012, Kazakhstan chaired the OSCE. The country’s officials make efforts to initiate international cooperation in the sphere of nuclear non-proliferation, activation of the combat for the world without wars and violence. The status of a nuclear-free country enhanced Kazakhstan’s positions in the pursuit of nuclear disarmament, stability, peace and global security. Besides, nuclear disarmament became an important factor of political and economic development, internal stability of the country. Kazakhstan was the first country of the world to unilaterally abandon nuclear weapons and closed one of the world biggest nuclear test sites in Semipalatinsk. Today, Kazakhstan is the leader of the CIS integration. The issues of formation of the single customs, monetary and financial space are successfully addressed within the EurAsEC. The work on formation of a deeper integration structure – Single Economic Space is conducted. Speaking of the results of establishment, development and strengthening of the country’s independence we can confidently state that the country and its leadership has shaped the right course and defined the right directions.